The Grand River Bead Society had a wire wrapping class last fall. What intrigued me was what the instructor used to patinate the final copper pieces. She didn't use liver of sulfur which is arguably the most common product used to darken the color of popular jewelry metals. 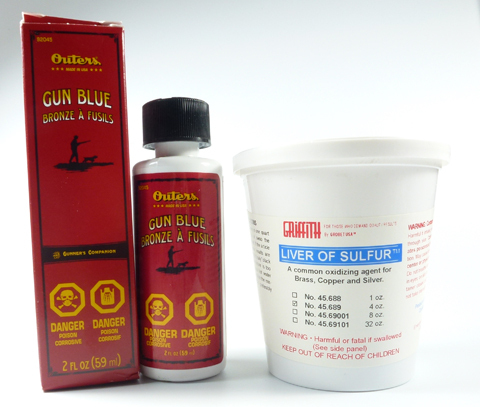 She used Gun Blue which has one huge advantage over liver of sulfur - no stinky smell! Otherwise check the useful links below for some of the dozens of "recipes" and alternatives. (If you are going for the boiled eggs method - remember whole eggs or whites. Not yolks). 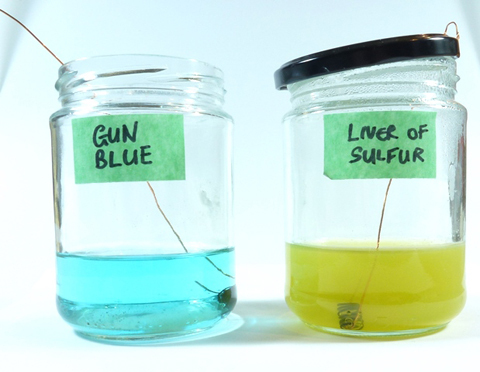 Gun Blue just happens to be a convenient copper sulphate solution. It also contains selenium dioxide and hydrochloric acid. Liver of sulfur is mostly potassium sulphide. When the solid form is mixed with water, a smelly gas (like rotten eggs) called hydrogen sulfide is released.The gas is poisonous in large amounts so it should be used with adequate ventilation. Also be careful not to get either solution on your skin. Wear gloves if necessary. Keep safely stored away from children and pets. Before you freak out, keep things in perspective. There are other nasty compounds around the house we have to be careful about too - bleach and ammonia, another noxious gas, are two examples. 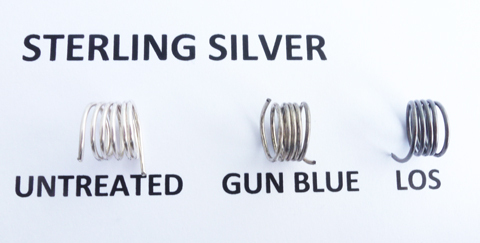 The instructor happened to mention Gun Blue does not work with sterling silver. Intrigued, I decided to check out the reaction with different jewelry metals. I may be a retired scientist but it doesn't mean I can't still do some experiments! I didn't fancy working with liver of sulfur outdoors in the middle of winter so I used it carefully in my workroom which is a fair size room ie not a closet. The gas disperses very quickly in larger spaces. Gun Blue comes in small bottles of 60 mL each. I used 2 bottles in a small glass jar. I heated about the same amount of water in another similar jar - about 45 secs on high in the microwave. (Hot solutions hasten the patination). Only after that did I drop in a tiny pellet of the solid liver of sulfur. I closed the lid immediately and swirled the bottle to dissolve the pellet. 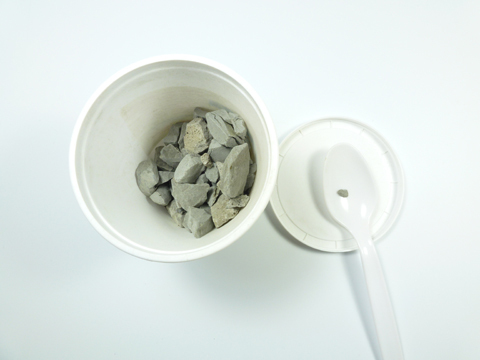 Note that I used a plastic spoon to fish out a small pellet from the bottom of the container. Plastic tweezers are fine too. Just not anything metal unless you want to patinate that too! You're probably saying - "What about the metal lids of the jars?" I used lids which are coated on the inside so the metal didn't react with the solutions. Acidic foods like salsa are sold in such jars for that reason. 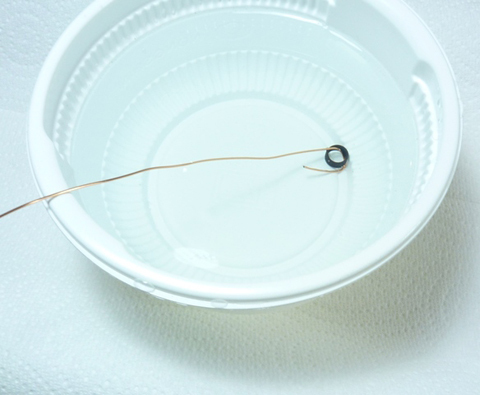 I made hooks using coated copper wire which also doesn't react with the solutions. Alternatively, use plastic tweezers. I also kept the lid of the LOS solution closed as much as possible and worked at arm's length. I didn't really smell anything except for a faint whiff or two. 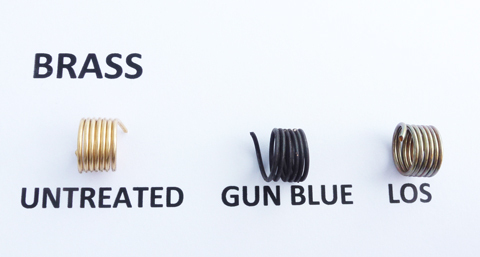 Gun Blue turned copper, brass (copper-zinc alloy) and bronze (copper- tin alloy) very quickly to black - faster than the LOS solution. 5 seconds is too much so I recommend dipping these metals in Gun Blue for less than 5 seconds so they won't get so black. I have to say that the LOS treatment for brass looks lovely. The characteristic color of verdigris can be seen with the LOS treatment of bronze. Gun Blue did work somewhat on sterling silver but not as well as with LOS. I took the sterling silver coil dipped in Gun Blue and re-dipped it this time leaving it in for a few mintues. Lo and behold! It did darken. LOS failed to patinate bright aluminum but Gun Blue did darken it. Dispose of the rinse water down the drain with lots of water. 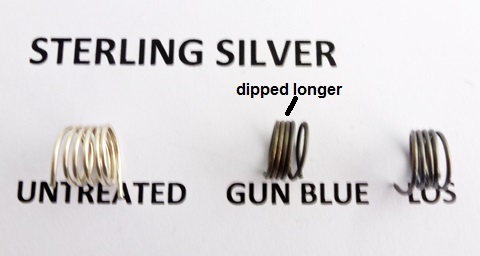 Just keep the Gun Blue stored in a safe place wrapped in foil until the next time you use it. The foil will keep light out and lengthen its useful life. Top up as needed. Glass containers are better than plastic as there may be interaction with the plastic. Anyone who works in a lab would recognize these two tips. Solid LOS doesn't last - it decomposes very quickly with time and exposure to the air and light. Note Many artisans now prefer to work with LOS gel which is stabilized and will last. The LOS solution I made is a bit murky because my LOS supply is old but it was still workable. You can reuse the LOS solution for as long as it has that chartreuse color - only a few days at most. Just make sure you screw on the lid tight and cover the jar with foil like for the Gun Blue. I am leery of reheating LOS solutions in the microwave - not good to accidentally bring it to boil. So if you really want to reuse it, I recommend standing the closed jar in a bowl of hot water (swirl the jar occasionally) to warm it up. I don't often patinate so I find it better to just make up a fresh solution every time. After you are done with the LOS solution, leave it around in the closed jar and it will soon go milky white as below. There is no longer any smell when the jar is opened. Just add more water and pour it down the drain with lots of water from the tap. Some people actually pour their LOS solution in the garden. I think they may be confusing potassium sulphide (LOS) with potassium sulphate (fertilizer). Two different chemicals entirely! Gardeners do use LOS but in fungicidal sprays. No animals or humans were harmed in the experiments with Gun Blue. So I must say I do like the non-violent association with the use of this chemical. Gun Blue is a lot more convenient compared to handling LOS and has no ghastly smell. Works very fast too without any heat. For people who do not patinate often, Gun Blue is a better alternative as there won't be any waste. Most of my LOS supply is going to go off soon and will be next to useless! Some artisans like to use more dilute LOS solutions so they can obtain the right darkness of patination they want with repeated dunking and rinsing.The trick with Gun Blue is not to dilute but to time the exposure of the metal to it. 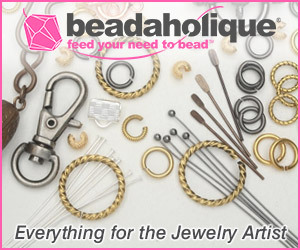 Just a few seconds for copper, brass and bronze but a few minutes or more is needed for sterling silver. 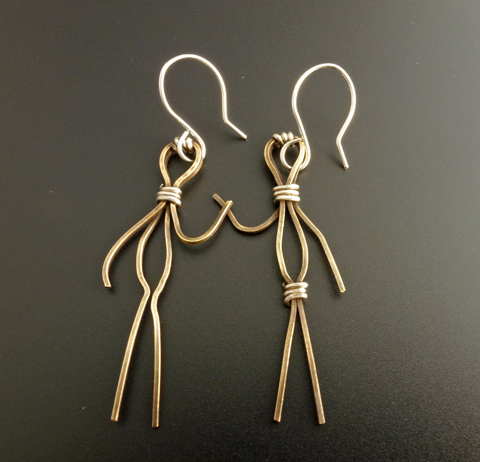 The differential reaction to Gun Blue was exploited in my People Earrings (an affectionate couple!) 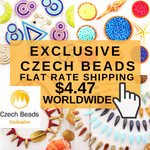 now in my shop. I used brass wire and wrapped with sterling silver. I dipped only for a few seconds in Gun Blue. This didn't do much to the sterling silver but the brass turned dark. Some light buffing with #0000 steel wool brought up the color of vintage brass. 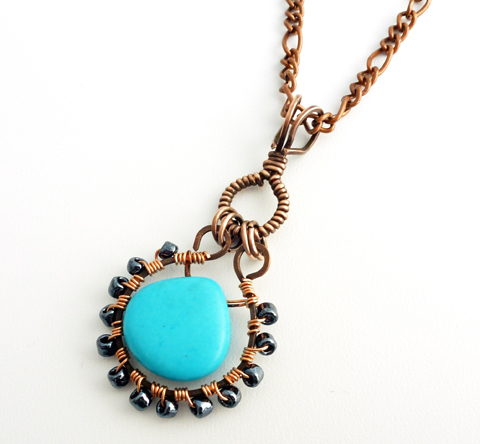 I also deliberately used coated copper wire for the wrapping part for this turquoise with antiqued copper pendant necklace. The coated copper makes for a bright contrast with the patinated copper as it didn't turn dark. 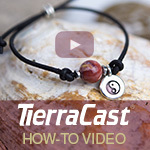 It is best to be careful with porous gemstones but the turquoise survived the quick dunk! I have tried gun blue for patination and really like the effect on copper. I can only get gel here in England, so I used it neat in a jar. I left some copper clasps in the solution for a while longer than normal and even after tumbling they retained a lovely steel grey colour, much like dark pewter. I can't comment on LOS as I have never tried it, but looking at your experiments I will do as I like the milder tones it produces on some metals. Thanks for the tip Catherine! I did not know there was a gel version and that it is available in England! Wow, interesting article. 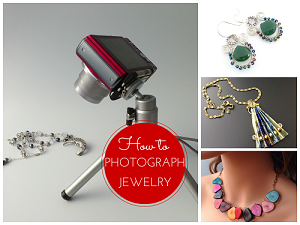 I'm always looking for a better way to add a patina to my jewelry. I found this product on Amazon and it's on my wish list now. Thanks again! Very interesting! I've no idea what this is called in Sweden, nor if it's available here (strict gun laws, but hunting is a popular past time), but it'd be interesting to test. When googling, trying to find something, I stumbled over a gun blue pen. 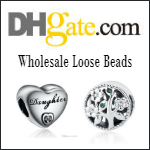 Wonder if that could be useful as alternative when oxidizing stamped or engraved jewellery? Or when just wanting to make patina patterns? The gun blue pen is designed for touch ups. Have you tried googling Bay, Maneki? Pearl, what wonderful research you have done. Thank you. I stopped using LOS in the solid form several years ago as it was unstable and I didn't use it often enough. I now use the LOS gel with much better results. I have used the baldwins patina which I think is gun blue and was not as excited about results, I will try again after your experiment. This is an old thread but I thought I would mention that you can get selenium poisoning from gun bluing. Be extremely careful when handling this chemical! All chemicals are dangerous, and not all of them are smelly to tell us they aren't good for us. I prefer LOS but as in currently using steel, there's really no way around gun bluing. Yes, gun blue can cause selenium poisoning. Poisons have to enter the body somehow to cause damage - the 3 main routes are ingestion, inhalation and skin contact. Most cases of selenium poisoning are due to ingestion of gun blue. But if you are careful with it, it is fine to use. As with other potential poisons in the house, keep it away from pets and children. LOS is also toxic and requires caution too - the smelly fumes are not good to inhale so ventilation is recommended. People who use LOS a lot and over a long period of time are most at risk. BTW All things are potentially toxic - even the very water we need to drink to survive. It is usually a question of dose. 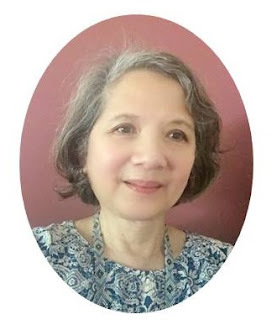 If you drink too much water in a very short space of time, it can be fatal - what we toxicologists (I am a retired analytical toxicologist) call water intoxication. Do you have to seal gun blue after pagination? 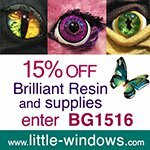 If so, is Renaissance wax suitable? I realize this is an old thread, but hopefully someone will notice my comment. Thanks! Hi Pearl- I also have been wondering about the skin contact warnings for gun blue. I like all the perks but if used on bracelets or necklaces that have prolonged contact with skin, how concerned should I be? 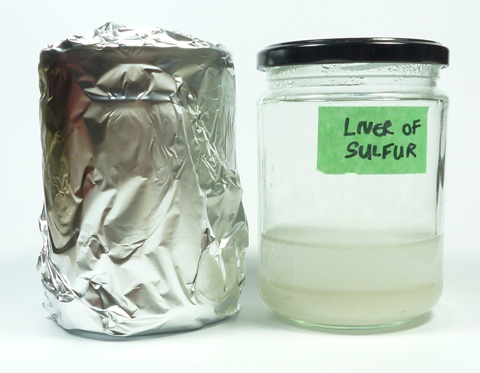 Does liver of sulfur have long term effects if in contact with skin in similar fashion? The answer is there is no skin contact issues because in both cases (gun blue and liver of sulfur), you remove the chemicals with the water rinses. But for the jewelry maker, you should avoid breathing in the fumes from LOS. In both cases, you can also wear gloves to prevent any accidental contact. I usually take care and don't bother with gloves. And for both, store in a safe place away from children and pets.